This couple is THROUGH with debt! It has now been five months since they announced that they were breaking up with debt. Here is this month's update! This is month five, and as you can see (from our Debt Freedom Date calculation) we are on the way to debt freedom. Joe's system gets much easier with time! We've really changed our financial lifestyle. This month was fairly easy. We'd like to pay more than $325 on the Discover, but some other things came up and we had to plan for them. However, we didn't accumulate any new debt! We'll use our tax refund to pay off the Discover balance, and begin working to pay vehicle #1 off about ten months early! We get paid on the 15th and 30th every month. A few months ago I couldn’t wait for those checks to come in because we were dependent on them. About three months in to this, the “pay days” became regular days. Any challenges you want to issue to others who are reading the web site? My wife basically dragged me to our first meeting with Joe. Our finances weren’t horrendous, but weren’t great either. We had a few thousand dollars in savings, but were living pay check to pay check with some debt. I was embarrassed for an outsider to look into our personal business. My first question to Joe was, “What qualifies you to tell me how to handle my money?” Joe briefly told his story and I began to listen and realized I wasn’t going to be judged on my past financial decisions. This put me at ease. We’ve been doing this for 4-5 months now, and it has changed our lives. I still buy what I want, eat what I want and go where I want, it’s just budgeted. We are paying off debt quickly, and working towards financial freedom. My point … I know someone out there is skeptical or embarrassed about their situation, its okay. Call Joe! I am so fired up by Couple #2's progress! I am ready to CRY! Couple #2 is ON FIRE! They have been on this journey for just FIVE months, and they have already paid off $11,693! They are experiencing a time of blessing, and they are taking full advantage of this time to knock out their debt! While they did not totally eliminate a debt this month, they did reduce their debt by $1,720. Simply amazing. Readers – What you are seeing unfold before you with Couples #1 and #2 is what I am seeing literally HUNDREDS of people do! There are HUNDREDS of people who have taken control of their finances, developed a written spending plan, and are absolutely changing their entire financial future! Couple #2 – You guys are inspiring others to take their finances to the next level! Thank you so much for sharing! Have you had enough? Have you had your "I Have Had Enough" Moment? It's time to put together a plan that helps you win with your finances. You can start by putting together a written plan using one of the budget forms available on the "TOOLS" page. Just click on the word "TOOLS" at the top right-hand corner of the page. Want to read my story and learn how to take your finances to a new level? 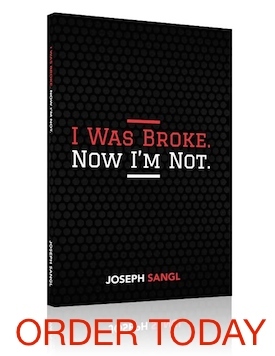 Purchase a copy of I Was Broke. Now I'm Not. I can promise you that it is written at a level you can understand and immediately apply to your finances! You can receive each post from www.JosephSangl.com FREE via E-MAIL by clicking HERE! I can’t remember how much the Home Depot, Providian or Belk’s payments were, but think about when you get to put (my guesstimate) over $900 a month on that car and you will have your car paid for in just a few month. That will rock! I have a car that we own and one we are working to pay off and it is awesome to know that car is paid for. In less than 3 years (since you said your income tax refund is going to Discover) you will be debt free. You won’t be paying all that interest and think of the retirement you can have! Think of what you can do for God’s kingdom. It will so be worth it! We started our debt march in October after attending Joe’s 5 week class @ Newspring. We had a debt freedom date of 40.5 months. It is now January and our debt freedom date sits at 21.5 months! We have been blessed and are able to give to Gametime as well! Thanks to God and Joe for being an inspiration to folks like us! Of course, a baby on the way will sort of force you to change.. but I just guess that’s what it took for God to open my eyes and realize how wasteful I have been with his money! Our stretch goal is to be debt free minus the house by October of this year! Keep up the good work all! I was just glancing on here and then saw the SCSLC debt. I don’t know if everyone with a loan through them is aware but they are willing to write off some of your debt if you qualify. You will need to fax them a copy of your degree. In my case, I got a BA and they wrote off the last $500 of my debt.